Merkle, which is part of the Dentsu Aegis Network (DAN), made its debut locally in March when the group took on and rebranded the Columbus data marketing business to Columbus, a Merkle Company. The move saw Columbus’ team of 100 performance, experience and data marketing employees immediate become the frontline for Merkle’s Australian efforts. The latest acquisition sees Amicus Digital rebranded to Amicus Digital, a Merkle Company. At the helm remains co-founder and current MD, Blair Cooke, while co-founder Jessie Mitchell, stays on as commercial and client services director. 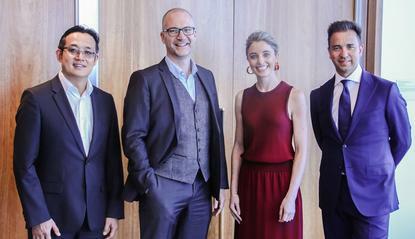 Cooke will reporting both to Dentsu’s A/NZ CEO, Simon Ryan, and Merkle APAC president, Zhengda Shen. Amicus was established three years ago and has offices in Sydney and Melbourne. Its focus is on using data and technology in consumer experience management. Financial terms have not been disclosed. Shen stated Australia is a priority market for Merkle. “On the back of bringing Columbus and DWA into the Merkle family locally, it’s critical we build on this momentum and continue to build out our capabilities to establish a strong local market position,” he said. Merkle acquired DWA, a B2B digital media and marketing agency based out of San Francisco, last December, picking up skills in programmatic, search, social and demand generation. Ryan said Amicus Digital’s market-leading reputation for expertise across all aspects of Salesforce Marketing Cloud brings an in-demand offering into the group and cited strong cultural and strategic fit across the two businesses. “Fully backed by the power of the Dentsu Aegis Network and with our clients increasingly looking to their agency partners to provide seamless expertise across multiple communications services, building our capability across data and digital skills is a strategic imperative,” he said. Cooke, meanwhile, said the sale to Merkle is the next step in achieving the business’ ambitions. “Merkle is an incredibly impressive business globally, with exciting ambitions for APAC. Jessie and I could not be happier with the cultural alignment we have with the Merkle team,” he added. Earlier this month, Dentsu appointed Min Lu as its first VP of network development for Merkle Asia-Pacific to spearhead the brand’s business expansion across the region. In this role, she is responsible for adding new capabilities, strengthening market presence and driving acquisition integration and synergies across the DAN network in Asia-Pacific. Last week, Merkle also launched its Merkle Innovation Cloud 2.0 in the local market, based on Adobe’s Experience Cloud. The new offering is tapping into the software vendor’s Adobe Sensei artificial intelligence and machine learning capabilities and is designed to demonstrate how data and technology can be used to personalise customer experiences. In its announcement, Merkle said MIC 2.0 builds a digital foundation that allows for testable real-time use cases in the lab around how brands create more meaningful interactions with customers. Dentsu acquired Merkle in 2016 in a deal worth more than US$1 billion.